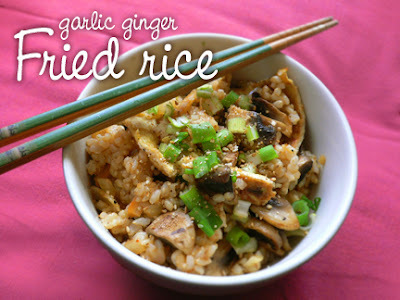 There are lots of things that can be done with leftover rice, and making fried rice is one of them! This is a Korean version which uses sesame oil, green onions and kimchi -- but if you don't have or don't like kimchi, just leave it out and savour the rest of it! Heat 1 Tbsp oil in a wok-type pan over medium-high heat and add garlic, ginger and onion. Saute until golden brown, adding mushrooms or other chopped vegetables if using (ie. bell peppers, broccoli, sprouts, etc). Then add one more tablespoon oil and add rice. Mix well, breaking up clumps, and stir in kimchi. Season with salt and pepper and add sesame oil. Continue frying until well combined and some parts get lightly browned. Spoon into 2 bowls and, if you like, top with sprouts, vegetables cut up into matchsticks, and/or eggs. The eggs you can prepare two ways. 1) Beat eggs with sesame oil, salt and green onions and fry into a thin flat omelette. Slice into strips and serve on top of rice. 2) Fry each egg separately, sunny side up, and serve on top of rice. Garnish bowls of fried rice with toasted sesame seeds and green onion and enjoy! I've gotta quit hitting your blog before I go to bed. You're makin' me hungry, here, Fran!